No doubt released to coincide with any ‘Godzilla Fever’ generated by the latest Godzilla reboot1, Avatarzilla ($1.00) hopes you’ll be intrigued enough to plop your jumbo-sized digital self— complete with whatever ridiculous outfit you happen to be wearing— into a cramped metropolis in order to cause a little havoc. Too bad this mash-up shares more in common with the bland-to-bad-to-terrible 1998 Godzilla reboot2 than the new film (which I hear is pretty good). To start with, you can choose from a whopping total of two(!) special attacks, shooting either fire or a laser from your mouth / eyes. I’m not sure which. The game’s lone map, a congested cityscape, provides plenty of buildings for you to demolish3 and / or walk awkwardly through, using said special powers, or a less-effective (and less fun) combo of punches and kicks. There is no real single-player option in Avatarzilla. Minus filling the minimum requirement for an XBLIG demo, or the chance to lumber around unopposed (the tiny helicopters that hover around the city do not attack or otherwise harm you) and burn a hole in random buildings, there is no point in loading up the solo option. Plenty of multiplayer-only games have this problem, and while I personally favor shoddy AI bots over a vacant ‘practice’ map any day of the week, you shouldn’t immediately write off a game because of it. Or perhaps you should. Even in an empty arena, the framerate dips once you start destroying buildings, slowing things to a crawl when I spammed my laser attack. Of course, some of that could be forgiven if the online battles were intriguing. Sadly, I wouldn’t know. I never once found a game to join, and no players ever entered the matches I created. So in essence, I’m left with a game I cannot ‘play’, one marred by technical issues and boring combat even if I could. Coming from the same developer behind Stop the XOID!, a self-confessed beta where I was similarly unable to find online matches (but still enjoyed), I expected better. Nothing in Avatarzilla was given much thought or attention. It plays as such, a quick cash-in product that should just as quickly be forgotten. Avatar Dairansen -アバター大乱戦- ($1.00), which translates roughly to ‘Avatar Battle Royale’, is a 3D Arena Fighter that plays like a third-person shooter. There’s nothing strange about that. It’s a style that’s very similar to the brawling you’d find in certain Naruto / Dragon Ball Z games, albeit on a smaller, not-as-epic scale. You won’t, say, spawn a thousand versions of yourself to beat down your opponent and toss him into a mushroom cloud (but one can dream). That’s not to say the action doesn’t ramp up in Avatar Dairansen. It does, especially in tighter stage layouts and with a full party. You just won’t find any (occasionally) melodramatic, spiky-haired combatants here, unless your avatar is dressed that way. Given the online play (up to four) and personal customization that your avatar affords, you can unintentionally stage some ridiculous-looking battles. …and tend to look cool and hand out a decent amount of damage. Arenas feature the Minecraft gene pretty liberally, but that serves entirely as a way to illustrate the chaos your avatar and others create over the course of the fight. Having the high ground means little here. Hitting opponents with stronger moves will alter and destroy the surrounding terrain, throwing subtlety and strategy to the wind. As such, most battles will probably boil down to frantic dashing and the spamming of heavier attacks, but like any light-hearted fighter, it’s at its best with friends pummeling each other to oblivion. Some of that charm is naturally lost when the game is minus human opponents, though the AI is an able stand-in. You can build and share your own arenas, as well, with a decent selection of tiles and settings. I can’t see anyone but the most ardent Minecraft / fighting fan really messing with it for long periods at a time, however. For a quick bout or as a party game, it’s worth the buck (it’s also apparently on sale now, set to go up to $3 at some future point). If you do have the itch for an over-the-top theatrical brawler— in condensed form— then Avatar Dairansen is a good deal at the current price. That old saying, how you always hurt the ones you love? Well, it works both ways. The developer of Ultimate Drunken Warrior ($1.00) is NeuronVexx, the same man behind the Terraria-like, create-a-world indie Dinora. Despite some flaws, and the not-exactly-original idea, that game gave you a pretty expansive sandbox that you could literally still be playing now, and not ever build the same world twice. It was impressive, another avenue that opened up to show what XBLIG developers could do. And now, we get Ultimate Drunken Warrior. Eh… Dinora this ain’t. On the completely opposite end of the room, wearing a bright green (and oh so controversial) mankini and baiting you with its pseudo-edginess, UDW is nothing special or inspirational. Letting you choose your level of drunkenness (i.e., how annoying you want your controls to feel) after a night of pub crawling, it’s a bare-bones tournament fighter for up to 16 intoxicated souls, locally. Both the playing style (direct control of each appendage) and art recall Mount Your Friends, which I have to admit seems like it should be on the leaderboard compared to Ultimate Drunken Warrior’s offering. Both games use ‘ragdoll’ movement to control their respective men. In UDW’s case, it’s to move the feet one at a time, or stumble around the screen in a slow shuffle. Fights are remarkably dull, swinging your character’s arms around in a stupor until someone eventually wins. That is, assuming you can rope a friend into joining you. There’s no AI fighters to spar against, and the game is just barely playable alone, only in smashing crates in a vague reference to ‘training’. Your score isn’t kept, and there’s no penalty or reward for even attempting it. It’s simply there to provide meat for the demo. Considering the competitive side isn’t much better, the whole thing feels like a lost cause from the start. Ultimate Drunken Warrior is the sort of juvenile amusement that might entertain some for a few minutes, were it not constructed in the cheapest way possible and costing you a dollar. As is, it’s a low-rent idea the channel could do without. Heroes of Rock (don’t ask me why it’s ‘Heroes’ when there’s only one character) is a 2D brawler with 3D characters and backgrounds, similar to the dismal Uproar! but thankfully much more stable and responsive. Oh, and there’s a guitar. And an original Heavy Metal soundtrack. 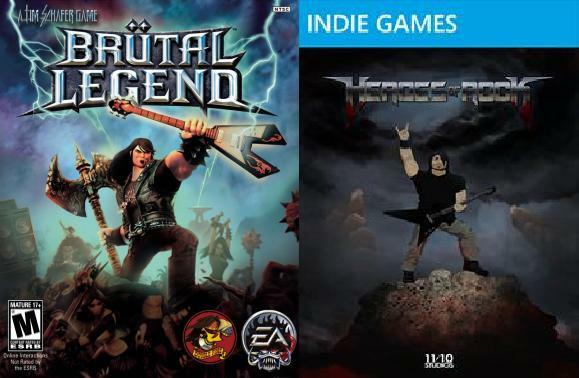 The cover strays close to Brütal Legend, though the gameplay isn’t even a genetic match. Jack Black isn’t coming to save you, Heroes of Rock. That’s not so much condemnation in my words as it is a vote towards the aforementioned ‘lukewarm’ feeling. Though there’s no storyline to speak of, the idea seems to be you’re battling a record company, a satanic one that’s killing music as we know it, or maybe that’s just what I’m making it about. All of your character’s attacks are guitar-based, too, as if to give that noble fight some irony. The game supports an excuse to drag out your plastic guitar. I did to experiment (the face buttons represent strong and light hits, as well as dash moves to either side, while the strum bar moves the character and controls the frequency of attacks), though I found it far easier, and more comfortable, to just use the controller. Enemies are exasperatingly easy regardless of control scheme, and come in the same three varieties; a devil in a suit, a rocket-launching devil that prefers to hop around the arenas, and a bigger, bouncer-type devil that reminds me of Hellboy. Your tactics with each won’t vary. Taking damage results in a lowered rock meter. Crank it to 11 by attacking and you’re golden (as evidenced by the louder music, a cheering shadow audience, and devil horns). To keep it there and thus stay alive, simply button mash at your own personal peril and you’ll emerge victorious from every skirmish. One tutorial and five stages later, you’re done. There’s no special moves to build towards or use, no bosses to take down, no ending to witness. Not so much as one line of text or a trivial ‘Thanks for Playing’. Heroes of Rock is a bare-bones brawler that hinges entirely on your appreciation of the music and the mashup genre. Still, it functions reasonably well, and the scene transitions from one path to another are nice, even if the animation is rough throughout. It’s not going to set the stage on fire or elicit any ‘Encore!’ chants, but if you’re really into the music game scene and need a reason to put the band back together (drag out old peripherals), you could do worse than the $1 ticket price. For those about to (Heroes of) Rock, I salute you. Your fingers, though, will not be as enthusiastic.